Aside from being aesthetically unpleasant, having teeth missing from your smile is a difficult thing to live with. Along with being detrimental to your oral health, not having a full smile is damaging to the health of your body as well. Feeling confident in your smile improves your self-esteem, and not being proud of your smile can be harmful to your sense of self and the way you interact with the people around you. Though you may feel as though there is nothing you can do, Dr. Jeffrey Nichols is able to restore your smile to its previous brilliance using dental implants! Dental implants are a permanent solution to having an incomplete smile. Whether you are missing a single tooth or a series of teeth, dental implants are able to complete your smile seamlessly. The first thing you need to do is set up a consultation with Dr. Nichols. He will be able to evaluate your smile in its current condition, and determine whether or not dental implants are a good choice for you and your smile needs. 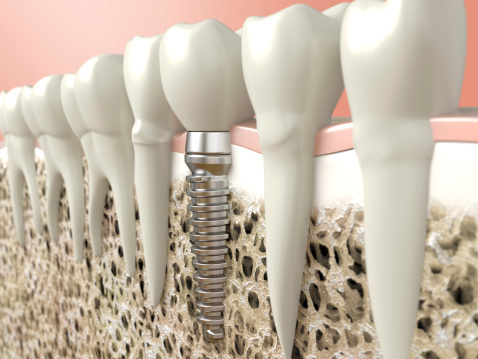 If you are a candidate for dental implants, that is where the fun and transformation begins! Dr. Nichols works very closely with an oral maxillofacial surgeon who will place the implant. A bio-compatible titanium post will be embedded in your jaw bone and replace the missing tooth root, ensuring a sturdy hold. Over time and with healing, your bone will fuse with the post, making sure your new smile is strong. After the healing, Dr. Nichols will work on your crown. The crown placed on top of your implant exactly resembles a tooth, making your new smile as natural looking as possible. At the end of the procedure, you are left with a new, brilliant smile you can be proud of! If you would like to change your smile using dental implants and would like the help of Dr. Nichols, contact our office today!